Everyone should come dressed for the weather in layers that can be added or removed based on temperature and in clothes that you don’t mind getting wet. We will go out on the water on the first day, so come prepared! The weather can be unpredictable and it helps to be ready for rain and cool weather at all times. 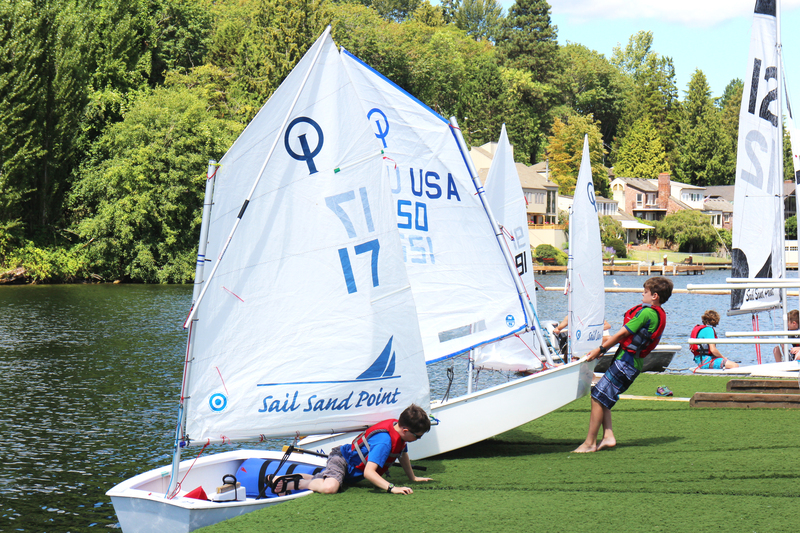 Sail Sand Point has lockers and cubbies to store extra belongings while participants are on the water, but we do not recommend storing anything valuable. Please be sure that you have signed a waiver before coming to camp. *In order to help us reduce plastic waste, please consider using reusable or recyclable food storage containers and water bottles. SSP has a water bottle refill station, as well as recycling and compost bins. On the first day of all youth camps (except for Mommy/Daddy and Me), instructors will conduct swim checks and capsize drills for all participants. The swim check consists of entering the water while wearing a lifejacket, removing the lifejacket, briefly treading water, swimming a minimum of 20 feet, and then exiting the water. (note: Junior Opti participants will keep their life jacket on for the duration of the swim check). Participants in youth camps must be signed out of class each day by a parent or another previously authorized adult. You may authorize someone during online registration, at camp check in, or by contacting SSP. Parking is available in front of SSP’s building, and if our lot is full, overflow parking is available next to the Arena Sports Building. For driving directions, please visit our directions page. If you haven’t already, please review the new SSP Cancellation & Transfer Policy.